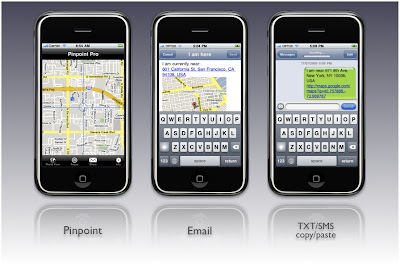 Pinpoint Pro for iPhone 3.0 is the fastest and easiest way to share your location form your iPhone. Let the built-in location service find your location. Just use the share function to send it via email or start up TXT/SMS. You can pinpoint any location by moving the map around to the location you want to share. Great for arranging meet-up. Email sharing is built-in. The app also copies the location into the clipboard so you can paste it in any app on the iPhone: Twitter, SMS/MMS, notes, blogging. The app prepares all the relevant information for you to share with your friends or family. Your friends receive the address information, an attached map image, and a link to google maps. If your friends have an iPhone they can see your location on the iPhone maps application. If they are on the computer they can see your location on a google map in the browser. I have just now purchased PinPoint PRO on my iPhone 3GS. Problem! When I start the program, it opens and then immediately aborts (closes)! It is hard to say what the problem is in your case. If you like you can send us a CrashLog. Best you send a email to support[a t]firepin.com and we can take it from there. Also would be cool to be able to see and input coordinates relating to map pointer and sent location to "meet me here"
Tim -satelite view is going into the next update. Next update will be submitted to Apple soon. Is there any way of exporting the co-ordinates & time data from firepin in to csv? Does pinpoint pro do the same things such as firepin, where you can send a link to someone and they can follow your trip progress in real time? I wish you would update Firepin. None of your paid applications have the tracking feature Firepin has. In my opinion it's the best application you have, but it needs some serious upgrades. Even if you make it a paid app. It has been come an essential application for our family travels, so we can all see where we are along the way. I would purchase one of your other apps but none of them do this. Please consider updating Firepin. Hi all! Has anyone tried Pozzr? ( http://pozzr.com ) Looks like a great tool.